I wrote a little program that generates all the combinations for a specified set and choice size; that is, it lists all the values of "n-choose-m". It's free, and runs on Windows, Mac, and Linux. For instance, if you have eight players and need to list all the sports teams of three people you could make, this will do that. 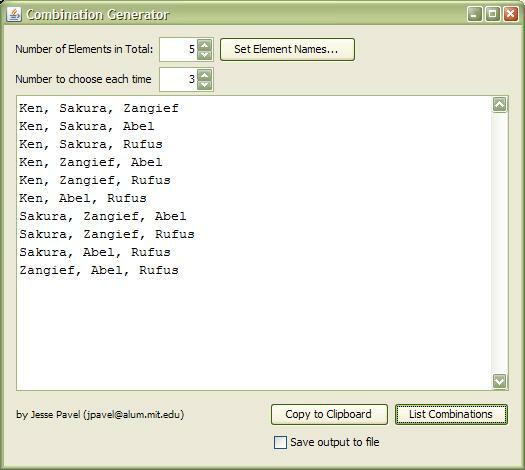 Updated: you can now write the list of combinations directly to a file, which should help if you need to generate a very large list. Let me know (jesse@humidmail.com) if you find this program useful, or if you have suggestions. * I use Michael Gilleland's code in this program.